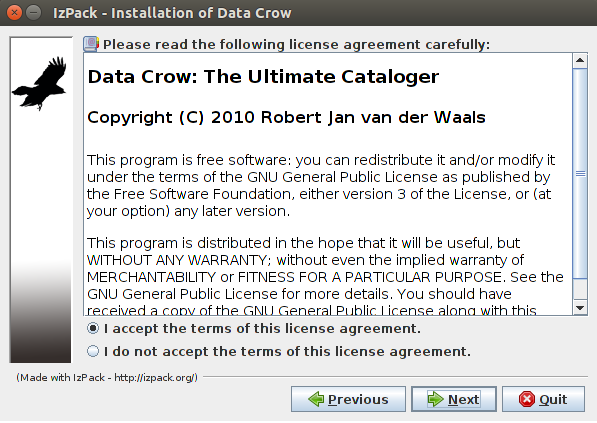 Data Crow is an awesome media cataloger and organizer application which is available free of cost. It works on all popular operating systems and lets you arrange your all collections in one place. No restrictions on the size of the collectables. Once you have organized all your collectables to a single large database, you can share is with your friends /colleagues/family, they can access and view your collection via internet or using Data Crow client. Let’s see how we can install its latest version on Ubuntu Linux 15.04 operating system. 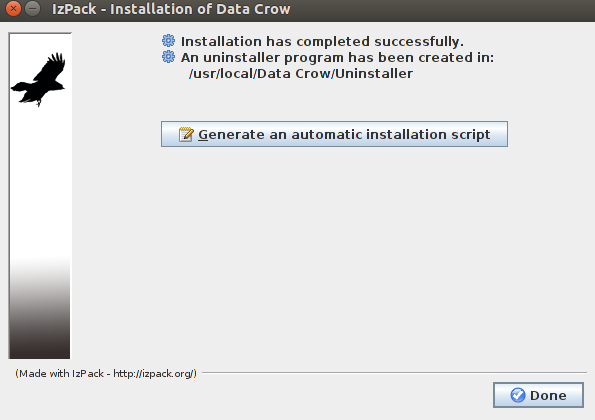 Before attempting to start the installation for Data Crow, we should have Java installed on our system. Launch your system terminal and run following command to install Java. 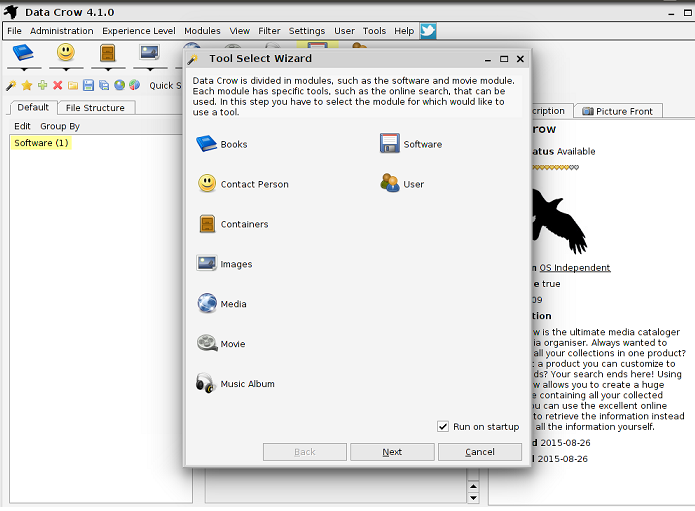 Once the installation of Java is complete, download Data Crow for Linux operating system from following URL. Launch your system terminal and go to the download location, here run following command to extract the downloaded file. Here is the very first screen it will display, click “Next” from here. Accept the License Agreement from here and click “Next”. 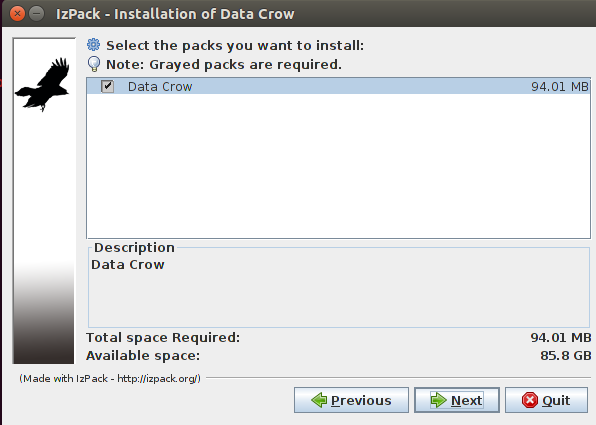 Specify the installation path for Data Crow, default path should work just fine. 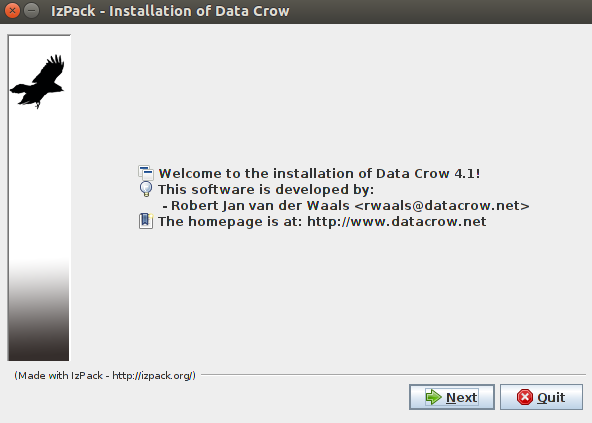 Choose Data Crow package from here. It will hardly take few seconds to complete the installation process. Click “Next” to proceed to the final step. Specify where you want the shortcuts to be created and which users can run this application on your system. It’s the final screen congratulating your for the successful installation of Data Crow. 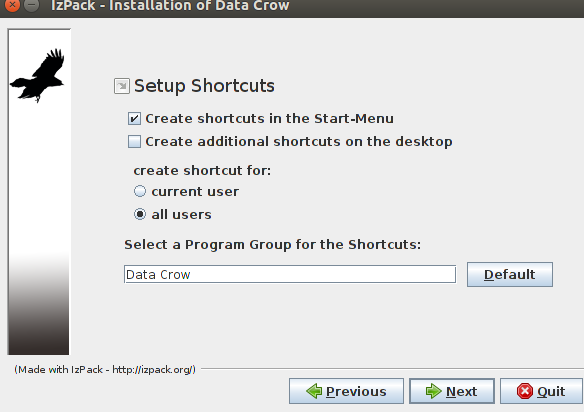 You can launch Data Crow from shortcut created on your desktop or from Applications menu. If you are unable to locate it there, launch it by running the following command on system terminal. There you go, it will take few seconds for some background configurations on the very first time launch. Start using this wonderful media organizer application. It is a lightweight tool and hardly consumes around 100 MB disk space on your system. It is fast, stable and mature application and is equally popular among users of all operating systems. Try it out today, hope you will enjoy it. Anyone willing to donate for this wonderful apps, here is its official web page.